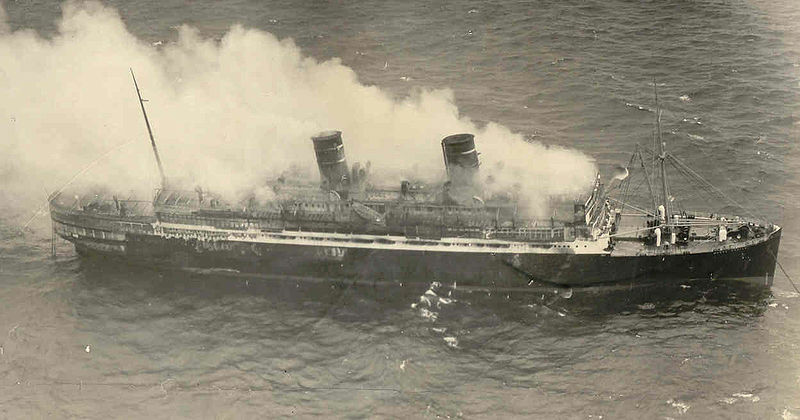 78 years ago today, a devastating fire destroyed the passenger liner SS Morro Castle off the coast of New Jersey. Operating between Havana and New York City, the liner had been built in 1930, but her builders failed to incorporate the latest safety features into her design. The fire began in a storage room around 3am and quickly spread throughout the ship. The ship’s highly flammable materials, de-activation of the trip wires for the ship’s fire doors and poor structural design allowed the Morro Castle to be engulfed in flames in just minutes. 135 passengers and crew perished in the disaster and the Morro Castle was beached and later sold for scrap. Partly because the Morro Castle burned so close to shore (and was a beach front attraction for several weeks before being towed to the breaker’s yard), the disaster served as the catalyst for more stringent maritime safety laws in the form of the Merchant Marine Act of 1936. It also influenced an entire generation of naval architects, including William Francis Gibbs the designer of the SS United States, to introduce multiple safety innovations in the next generation of passenger liners. Earlier this year, New Jersey authors Gretchen Coyle and Deborah Whitcraft published Inferno At Sea documenting the Morro Castle disaster. The authors interviewed survivors and archival materials to produce the most recent account of the maritime tragedy.